I decided to revamp my previous art Thread. Though that first one is - as you say - old and ugly, it's still absolutely adorable! Well, back then you did, anyway. I remember the last 2... don't remember seeing the 2015 one, though. Can't wait to see what you create next year! Edgy Prism Boy and Quick Tempered Fire Cat Girl. Well, after my time away for personal reasons, I guess it's time to get back into the swing of things here. I mean, it's really clever and well done, but... just looking at it makes me feel sad-like. You never cease to amaze me, girl. Necrozma is hurt. I'm still working on his backstory. I don't know how long this took me but... I'm ok with the results. I saw this one on your DeviantArt (and if I had an account there, I would have left a message there, too). The colours, the framing, the scenery (or this case, the minimalism of it), and even the way you've drawn Kairi in... everything is perfect!! This is real beauty, right here! By far my favourite work of yours yet! I tried to do a fake screenshot-esque, but I don't know how to make the filters look movie-ish. Also I forgot the subtitles XD She was supposed to say what the Sage tells your MC in Miitopia. You could use that image and Photoshop it to make it look movie-ish. There is a filter tabs with a filter gallery for you to choose a filter. It's easy if you have that tool. (02-09-2018, 03:43 PM)DashTwisterstorm Wrote: You could use that image and Photoshop it to make it look movie-ish. There is a filter tabs with a filter gallery for you to choose a filter. It's easy if you have that tool. I'm aware of it since I use Photoshop, but I don't know how that works. Well Filters are tools that will allow you to transform a picture into effects like scales, dots, saturation and lines. I know that because I'm doing Digital Imaging in college. Using the same scenery and same artstyle, you produce something of equally as tremendous beauty as the last one, if not more so! But it makes me feel different compared to the last one... I'm not even sure what the emotion is. Trying to do a Cinematic effect, I don't even know how I do that. Bonus exclusive to you guys... Just for laughs. Sora: "You look so familiar... Are you sure we have met before?" Sora: "Uhh... Nevermind you remind of a friend, she just looks like you." Unless I completely misinterpreted what you were saying, in which case I'm sorry about that. Sora and Kairi don't know each other identities. They think they're different people to each other. She does question him too. I deactivated my Deviantart Account however i'm moving everything to Tumblr for now on, also Incorrect Quotes lel. That last frame is the stuff of nightmares! Not sure who it's supposed to be, but to me it resembles a cyclops version of Amy Rose with the body of Vanitas. Nevertheless, your art is always amazing to behold! If you're into Miitopia, That's suppose to be a joke the look of the Dark Curse. The Vanitas joke is obvious. The hair well that's supposed part of "Shintsū's" Hair? Shintsū is the Reborn of My Miitopia playthough. He's the reason why all of that happens. Shin is pretty weird when reborned has part of Sora's hair and Kairi's hair, but his hair is brunette as Sora. Because most Artists draw there Reborns blue haired and I wanted to go with a "hybrid", since Sora and Kairi help him to revive. Although he's not referred by name in the game. But in the au is referred as Shintsū, Sora call him that, because the curse didn't remember his name. Well, I never played Miitopia, so that's probably why. Interesting concept you got going there. It's not like that the game mostly most of the AU stuff it's idea of mine. I'll list you all on Private. I was about to reply with what you just said underneath the image. 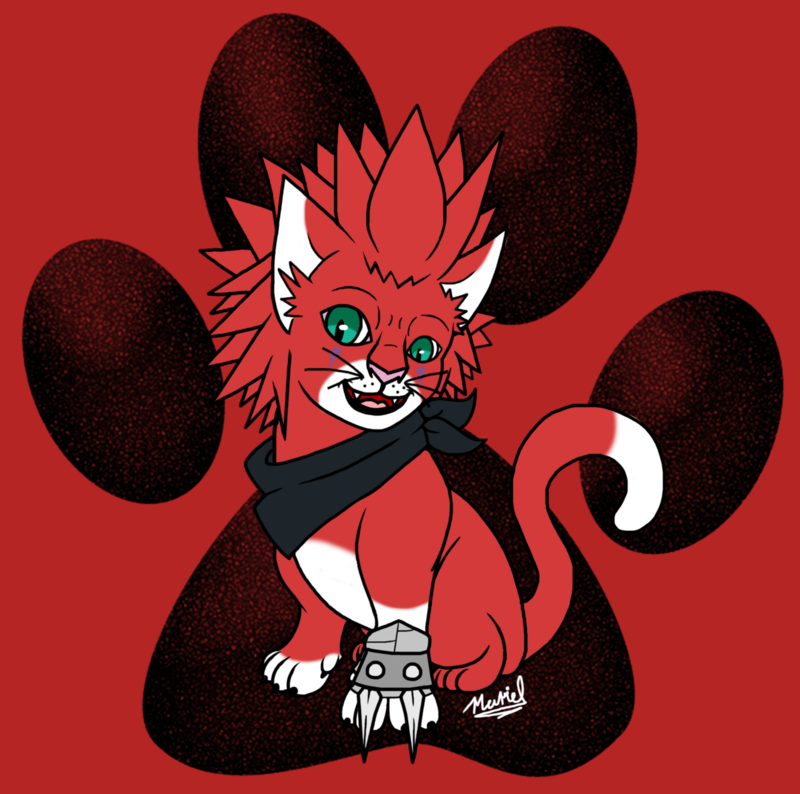 "Well no duh it's Axel as a cat, idiot! It says it right there underneath the drawing!" This one is really adorable! The only thing about this I can fault - and this is really just a very microscopic nit-pick - is that it is almost impossible to see his claws against the black paw in the background. Aside from that, this one is just about purr-fect! I love this one! I won't forget about it anytime soon! I got it memorized! Sheesh... what's it take to have a little fun when commenting these days? I can fix it. I think I should have turn the opacity less or pick another color. Since black fit better, I'll upload a fixed version later. I just wanted to draw my OTP. Sorry for asking this question, but are they kissing? It's hard to tell from the angle given. Regardless, another amazing piece of artwork! The lighting in this one is really atmospheric. No, I just noticed the mistake on this. It looks like they are kissing but they're not. Back up and running, I see? And, oh wow! Soraither is looking awesome (-er) now! Weird... I can kind of see my 'spirit character' in him. I always look forward to your work!